St Helens (2nd) v Wigan (1st) - Engage Super League XV Grand Final. Saturday 2nd October 2010. Kick Off 6:00pm at Old Trafford, Manchester United FC. Well how sweet was that. A perfect end to a pretty much perfect Super League campaign for Wigan. 100% worthy champions - well done to all the players and staff. It was a weird feeling though. We absolutely dominated the Saints from start to finish but part of me wishes that we won the final in a hard fought battle to the death. The reality though was that it was a very comfortable win and the final score of 22-10 flattered the Saints immensely. Well I say comfortable but for us Wigan fans who have been so used to being disappointed nearly men for so long, it was a hell of a long wait for the final whistle. Even with 5 minutes to go I was still nervously awaiting the final hooter. Saints were never going to beat us though. The losses of Leon Pryce and Kyle Eastmond were just far too much to overcome. Jon Wilkin is never a half back and to be honest bringing Matty Smith back from Salford was pretty desperate. Saints fans seem to be bemoaning Mick Potter because of an apparent no show in this final but personally I think they over-achieved in reaching at least the last two Grand Finals. Saints look to be in the exact position Wigan found themselves in about six years ago. The quality has drained out of the side and a big pack is all good and well but they have zero quality out wide. I was always confident we would win, if we didn't gift them easy territory and so it proved. Our day started in a very packed out Moon under Water pub at 9am with the train to Manchester being caught at 10:46. The train was packed but not too many needed to stand. I hear they were absolutely shocking on the way home? I got the tram up to Old Trafford and had to squeeze onto it. Why is their a total lack of preparation for an event like this? Extra trams, extra trains should have been put on but all we got was a normal service and they are always packed on a normal day, never mind Grand Final day! Arrival in Manchester saw Wigan fans gather in the superb beer garden at the Sinclairs Oyster Bar. 90% of those in their must have been Wigan fans. I've not a clue who that guy was who came across dancing but drunken idiot (although strangely sober for this final) "Scotty", cheered on by the Wigan fans, danced him into submission. Although the "shows your arse" chant wasn't good because he did just that! Anyway onto the game and the atmosphere at the Wigan end of the ground was superb. I was sat in the left hand corner of the East Stand and could look right to a huge sea of Cherry and White. It was a crying shame the minutes silence for Terry Newton was poorly observed by a small section of fans in our end of the ground. Obviously not Wigan fans, but Terry deserved better than that! The first half saw both sides have completions rates of over 90%, which is phenomenal for a normal game, never mind a pressure cooker final. The difference though was a superb kicking game from Wigan that always had St Helens on the back foot. Wigan's first set saw a high hanging kick from eventual man of the match Thomas Leuluai. It was looking poor at first but bounced well to put Jamie Foster under pressure. Saints only found 20 metres on their first set with James Graham being hammered by Martin Gleeson and Pat Richards. Saints in contrast made a poor clearance kick and this contributed to them being on the back foot. Our next set saw another good kick from Leuluai but Francis Meli caught it well before being wrapped up by Gleeson. Saints though made a dreadful error to gift us easy territory and a Michael Maguire coached Wigan side current side is always likely to punish. Iosia Soliola it was who's pass went to ground and Pat Richards snaffled it up easy. This got Wigan twenty metres out and swinging it right Paul Deacon, Thomas Leuluai and Sam Tomkins all got a touch before Martin Gleeson finished the move well, despite pressure. It's been quite a common try in the play offs to see Deacon, Leuluai and Sam all combine going right but Saints had no answer. Pat couldn't convert so the lead was just 4-0 in as many minutes. I mentioned in my match preview how Wigan's starting three-quarters had crossed the line 92 times in the Super League regular season, compared to just 64 for St Helens. A remarkable statistic when you bare in mind that St Helens scored 8 more tries than us during the campaign. It just shows how lethal we are out wide and this was shown in a quality second try in the 15th minute. Before that try, Wigan had still got St Helens on the back foot. They were really struggling in defence on their right wing. First Jamie Foster had to knock on or let Pat Richards have a chance to score, then a towering kick from Leuluai was batted back by Pat and knocked on by Matty Smith. George Carmont went close and a second kick, from Mike McIlorum of all people, was collected by Pat and Carmont went close again but trying to keep the ball alive it ended up going into touch. Saints had done well to survive all that pressure. I mean a stat on Sky showed Wigan had played 7 of the 13 minutes so far in the St Helens half with possession. Saints in comparison had only gone pass half way once and they only made 10 metres when they did that. So for all that pressure 4-0 was a disappointing return but Wigan soon responded with that class try I was talking about. It came after Wigan conceded their first penalty of the match with Sean O'Loughlin pinged for a high shot on Jon Wilkin. The penalty got them on half way but on the last Matty Smith put in a poor kick that was easily taken by Richards. Then after four tackles Wigan made their move. Leuluai sent Sam Tomkins on the half break down the right, Chris Flannery halted his charge but he offloaded back to Leuluai who in turn found Paul Deacon. Meli and Graham came back to stop him but he found a pass that got Gleeson over for his second of the game. It was an awesome passing move that took Wigan 80 metres up the field and Paul Wellens' desperate ankle tap attempt was not going to deny Gleeson going under the posts. Easy conversion for Pat made it 10-0. One of Wigan's many trademarks this season has been to score back to back tries in quick succession and they did it again here. Saints had survived one set but when Wigan next got the ball they forced a "back to one" under the sticks with a bomb from Deacon being flapped at by Jon Wilkin. Right under the posts they only needed one tackle to get the try. McIlorum from dummy half found Leuluai, who found Gleeson and Darrell Goulding finished off easily in the right corner. That was his 29th try in 26 appearances this year. Pat then hit a sweet conversion off the touchline to make it 16-0 after 20 minutes. Also in my preview I talked about how St Helens standards drop when Keiron Cunningham departs from the field but when he departed this Grand Final after 20 minutes, Saints actually had their best period of the game. They finally got an attack on our line in the 25th minute but Sam Tomkins brilliantly halted Matty Smith's charge for the line and then on the last Saints swung left but Goulding hammered Meli into touch. Brilliant defence! Saints came back though two minutes later with the help of a penalty conceded by Feka Paleaaesina for holding down. From that Andrew Dixon scored a soft try close to the posts, having been sent in by Wilkin. Easy conversion for Jamie Foster made it 16-6. That was a flattering score and Saints might have sniffed a comeback if they could find another quick try but Wigan are made of much sterner stuff this year. They had a full 10 minutes to negotiate before half time but they did that with little pressure on our line. Some poor St Helens kicks helped that cause but a Wigan side of the Brian Noble era would have come up with a crucial error or stupid penalty, its brilliant how the current set up have knocked that out of them. Late in the first half came what many saw as a massive blow. Pat Richards limped off with an Achilles tendon injury, which we now know is likely to keep him out for the start of next season. Personally though I wasn't too gutted because I just thought, well that probably forces Liam Farrell into having to stay on for the rest of the game and I absolutely love what that guy does for our cause. He has a superb work ethic in defence but backs that up by being an excellent support player in attack. Richards absence meant that Carmont switched to the left wing with Joel Tomkins filling in at centre. That really did annul the threat we had down that side with kicks in the first half. All the tries had been scored down the right but the errors were coming down out left. Anyway, we still attacked down the right and it continued to pay dividends. The first try of the second half was always going to be massive and both sides had chances to claim it. Leuluai went oh so close in the 44th minute but Jonny Lomax saved the try by stripping the ball off him. Beyond me why that can't be classed as a penalty try but instead it was an in field penalty and Mark Riddell took a woeful shot at goal that sailed wide. I'm not sure the cheer when he stuck his arm out to kick was wise in a final but the Wigan fans enjoyed doing that. Saints had two big chances. The first came on 47 minutes when Paul Wellens made probably their only clean break of the match but he threw a pass straight into the arms of Goulding. A huge relief. The second came in the 50th minute and had they scored it could have been a completely different contest. A poor knock on by Carmont, only our second error of the game, gave Saints a scrum ten metres out. From it Smith sent Wilkin charging at the line but he failed to take the pass. Had he got in the score could have been 16-12 and although Saints didn't deserve to get that close, it would have been a real nerve jangler for the final half hour. Two minutes later a possible 16-12 became 20-6 with Wigan going up the other end to pretty much seal the win. Helped by Saints being penalised for obstruction in possession, Wigan got the ball thirty metres out. They went right and Leuluai combined with Sam Tomkins again to send the little fella over. It was right in front of me and he showed superb strength to reach over despite pressure from Meli and Flannery. Riddell's conversion attempt again was woeful but 20-6 gave us huge breathing space. It meant Saints had to score three times to win. Rather than shut up shop Wigan continued to look for a killer try and Saints began to wilt in defence, which resulted in more penalties being conceded. Had Richards been on the field they probably would have just chipped away with kicks at goal but they tap one penalty until receiving an unmissable penalty right under the sticks in the 58th minute. An easy kick for Riddell stretched the lead to 22-6. From the restart Saints petulance was shown again with James Graham blowing off at the referee after Wigan regathered a short kick off. To me he should have been sin binned for that. It was blatant dissent and even in a final I think an example should have been set. It allowed Wigan to score what we all thought was the match clinching try but Farrell's effort was chalked off by video ref Ian Smith for obstruction. Farrell himself had obstructed a Saints player from tackling O'Loughlin in the process and it looked a correct call. Cunningham was back on the field for Saints to play out the last twenty minutes of his illustrious career. He has been absolutely quality for them over the past 16 years but his only contribution was to give the Wigan fans a huge cheer when he knocked on a simple pass from Wilkin. After that, Saints never looked likely to make a comeback in the final quarter. Wigan had this game well and truly wrapped up. Another conceded penalty on 70 minutes gave Wigan another shot at goal but this time Sam Tomkins shanked a sitter. Soon after Francis Meli claimed a basic try in the left corner to give Saints slim hope and although it made us Wigan fans nervous last 6 minutes it was just too little, too late. Foster couldn't convert so they still needed two converted tries to level at 22-10. When the clock went down to five minutes I still wasn't relaxed that the game was won, even though it really had been won long ago, but Wigan just closed out the contest to win our first trophy since 2002. Great scenes of joy at full time from both players and fans alike. Personally I didn't produce any tears but just 1,924 days since the 75-0 humiliation at Knowsley Road that victory was sweet. In fact this whole season made up for that result, the poor start to 2006, the 2007 and 2009 cup semi defeats, the 2008 Millennium Magic embarrassment etc etc.... those bitter experiences made this win all the more sweeter. Every player should have been proud of their efforts in the final. In fact the whole squad has been awesome all year. It wasn't just about the 17 men that played the final. I mean Amos Roberts 14 tries in the first 10 games of this season was huge in setting the platform for all that followed. Chris Tuson also made a massive contribution and was unlucky to lose his place so late in the campaign. Even Karl Pryce did his part when asked. I'm pleased also that the likes of Feka, Piggy and Phil Bailey can all depart with a bit of joy. I know Bailey didn't play in the final but although never a quality player he did a decent job for us in the last four seasons. Likewise Feka over the last five years. Good luck to them in their future ventures. You also can't forget Brian Noble's role in this win. He laid the foundations and laid them well. I must credit the match officials. I thought they were excellent and left no arguments over any decisions. In fairness, apart from the dissent by Graham, both sides played the game in great spirit. 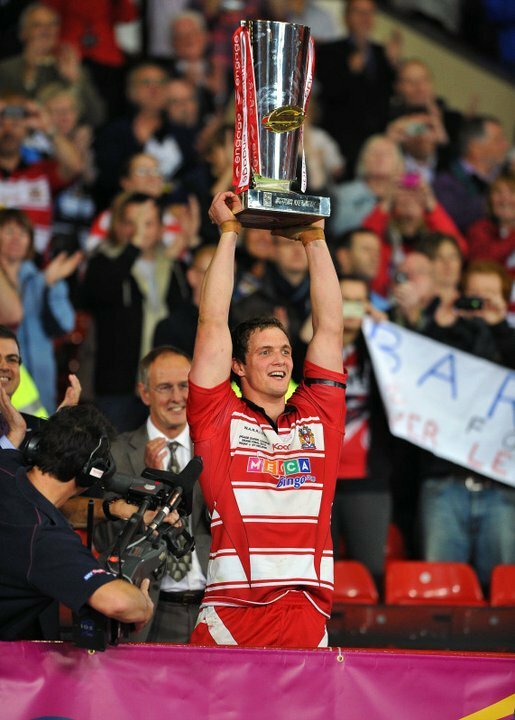 After the Wigan players went up to receive Grand Final rings, we had no idea what Sean O'Loughlin said on the tannoy but it was immense to see him lift that magnificent Super League trophy, our 19th title success. One of the things I love about doing this site is looking back and knowing about our great history and I'm really pleased that we can now be proud of a new chapter. As good a club as St Helens are they haven't produced in every era like we have. Saints had only won two major trophies (a league and a Lancashire cup) prior to 1952-53 compared to our 25 (8 leagues, 4 challenge cups and 13 Lancashire Cups)!!! We've always produced quality teams that win trophies and that's why we are the greatest team of all time. No one can argue that we didn't deserve the championship. We topped Super League from Round 3 and our only away trip defeat all year, in the league, was that 22-20 defeat at Bradford back in March. To bounce back from defeat every time we lost speaks volumes for the attitude of the players as well. Even Mr Bitter Schofield, who of course predicted a Saints victory, ate humble pie on his twitter feed. The only sad part about this win is that is brings an end to the season and marks the start of winter. But we've so much to look forward to including winding up opposition fans with that awful "that's why were champions" chant. Luckily we had a mini bus back to town and the night ended with plenty of beers in the Bowling Green up Wigan Lane. Those that wanted had a good dance to the disco but I preferred a more quiet reflection on a successful season. It was about 5am when I managed to go to bed but I never managed to make it out for the homecoming parade. Ah well, here's to another great year next year! Michael Maguire: "If we keep going and working as hard as we have been this year, hopefully other opportunities will come," said former Melbourne assistant boss Maguire, who has guided the Warriors to their first major trophy since their 2002 Challenge Cup success. The boys are a hungry bunch and there is no reason why the club can't continually move forward. I couldn't ask for any more commitment than they've shown this year and what they showed tonight really tells the story of that team. This is definitely up there with the biggest moment of my career. Pat (Richards) is the best player in the competition at the moment but we've been through times when when Pat has not been there and we knew we could cover his absence"
Sean O'Loughlin: "This is the best feeling I've had - it's been a fantastic effort this year, a massive achievement. We got points on the board and built pressure and worked hard. We knew (St Helens) can score tries but we've backed ourselves all year and we showed it tonight." Thomas Leuluai: "I needed someone like (Michael Maguire) who understands the game. I've learned heaps this year. It's a feeling of relief that all the hard work has paid off. It was a good team performance. We felt relaxed because we all had a job to and it was pretty simple at the end of the day." Pat Richards: "The victory definitely numbs the pain. I couldn't be happier. To be part of this win is something special." Andy Coley: "The desire in the squad is unbelievable - there was only ever going to be one result tonight. It means everything to us and the people of Wigan. It's been a fairytale story and a great year." St Helens coach Mick Potter: "We did some things we didn't practise for, though there was certainly no lack of effort. We started off on the back foot. We burned a lot of energy in the first 20 minutes. I wouldn't say it was won or lost then but it certainly contributed. It's hard to pull back a hefty score and against a quality team it makes it double hard. Even though we did make some breaks, we probably forced a couple of balls and made some uncharacteristic errors. I thought up until 10 minutes from the end we were still in the game. We just needed something to go our way and it didn't happen tonight but I don't want to take anything away from how well Wigan performed."